That Surf and Turf now costs an arm and a leg thanks to lobster's recent resurgence in popularity. But, as David Foster Wallace's famous essay, Consider the Lobster illustrated, throughout Colonial-era America, the crustacean was considered among the least desirable foods one could put in their face—a garbage meat fit only for the indigent, indentured, and incarcerated. 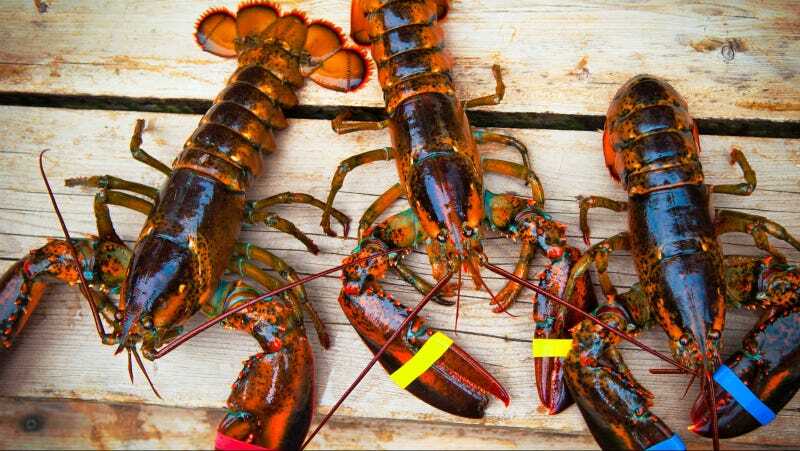 These days a live lobster will go for easily $5 a pound, according to the Main lobster industry, though they can easily spike 20 percent or more in a single season, as they did in 2012, climbing as high as $14 depending on how many fishermen can catch. However, when the colonists first arrived on the shores of New England, they faced the opposite problem: an overabundance of the shellfish. An unimaginable overabundance. Lobsters used to wash up on shore in drifts two-feet tall. One 17th century British historian by the name of William Wood visited Newfoundland and noted, "Their plenty makes them little esteemed and seldom eaten [except by the Indians who] get many of them every day for to baite their hooks withal and to eat when they can get no bass." The lobster also quickly earned a reputation for being a vacuous bottom feeder, willing to put anything—no matter how barely edible—in its craw. People ate so much lobster they got sick of it—though it doesn't help that they only cooked lobsters dead back then, not alive as we do today. People got so fed up with lobster meat, in fact, that they stopped eating it altogether. Or at least the respectable members of society did so. Instead, they began feeding it to their livestock—as well as the financially destitute, criminals, and indentured servants—rather than eat it themselves. According to 19th century Kentucky politician and social observer, John Rowan, the meat quickly became synonymous with lower classes of society and quipped "Lobster shells about a house are looked upon as signs of poverty and degradation." The meat was so reviled that indentured servants in one Massachusetts town successfully sued their owners to feed it to them three times a week at most. We should all be so unlucky. The stigma stuck for years. During the Victorian era, you'd spend about 53 cents per pound of Boston baked beans but just 11 cents per pound of lobster. However, some folks were willing to give lobster a shot as far back as the 1850s. Sure, it'd be the lowest price item on the menu—roughly half of what you'd pay for even chicken—and nobody would be caught dead eating one but it was available. Lobster was something you'd feed to your cat, not your dinner guests. It was actually the rise of seasonal tourism in the 1870s—wherein the well-to-do from New York and Washington would retreat to Boston from the region's oppressive heat and humidity that lobster began becoming a sought after item. Visitors, upon returning home from their vacations, would find themselves still craving Boston baked beans and boiled lobster. And, more importantly, willing to pay handsomely to get more.